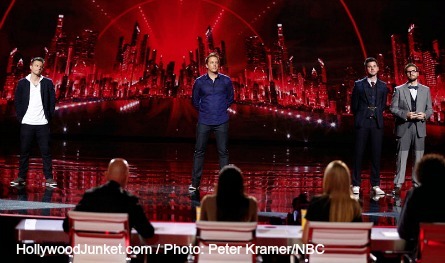 Host of “America’s Got Talent” Nick Cannon opened the show with the question “who will keep rising, and who will run out of steam tonight?” as the Top 12 performed tonight for America’s votes on Wednesday’s Results Show where special performances will be by The Muppet’s and AGT past finalist Jackie Evancho. The first act of the night, another young girl starting her singing career out on AGT – Mara Justine. After their game with numbers again – this time played out on one huge Lottery Scratcher onstage. Howie reacted, “I don’t know if you are really lucky or really magical. Amazing! This night is amazing!” Howie said, “You’ve been consistently great all season long. They always come out with something great. You’re so well rehearsed. This is a phenomenal night.” Heidi said, “I love the bantering as much as I love your magic. Maybe you’ll win the AGT lottery and get the grand prize. Mel B said “how do you do it? How do you do it? You’re just great!” Nick asked them how did they do it? They said “we just got really lucky”. After another beautiful performance, Howard was still caught-up on their name. He said, “The only thing I”m not a fan of is your name. You really know how to read this audience.” He said they opened-up and “gave a blast”. Heidi said “your performance tonight was grander and more majestic than your other performances.” Mel B said they really stepped-up to the plate and delivered “a stellar performance”. Howie said he hopes America hears what they can hear. Sons of Serendip said it was “such a warm audience” and made them feel at home. Going To Turn It Up! Last week, Howard told Christian that he was becoming a “dog act” and said he should leave his dog Scooby out of his act. So, Nick gave Howard Scooby to hold during his performance. Howard responded that Scooby belongs in his lap. Christian took Howard’s advice to heart and said he’s NOT a dog act. He’s a hand-balancer and said he was going to “turn it up” tonight. But, he did have another dog in his act in the opening. Heidi, who was now holding Scooby, was torn, “You are such an amazing balancer.” She said he needs to balance it more because she wants to see both him and the dog. Mel B called it his best performance to date, and called him a “cutey patutee.” Howie said Christian also has a “paw balancer” in his possession, and he doesn’t like Scooby “poo-poo”. Howard said he means the criticism as constructive. He told him tonight the audience could focus on him and that he came off like a million dollar act. Emil and Dariel took the advice of judge Howard and Howie when they suggested they add a singer. So, they added a choir tonight to an Aerosmith song “I Don’t Want To Miss A Thing.” That was massive! You really owned it! You guys are really special. Howie said “I love Steven Tyler and tonight I did not miss Steven Tyler. Howard gave them more advice – “I still feel Eddie Van Halen was the best guitarist there was.” He said they need a front-man, then called them “phenomenalosity ” Heidi said, “I expect the unexpected. I felt that you were a little bit safe.” The audience booed her. Howie and Mel B told her she was “wrong”. Nick Cannon even said he thought they “rocked” the song. Mel B’s “Off The Chain” Act! Nick asked them how much work did the put in? THe 12 year old said they put a ton of work in! Nick Cannon described Quintavious as “A powerful voice way beyond his years!” Quintavious sang “I’m Going Down” original song performed by Rose Royce and made famous in the “Car Wash” movie in the 70’s. Afterwards, Nick told Quintavious that he’s way better than him! Howard said Quintavious is going to have a better wardrobe than Nick. He also told him “you’ve got something so special” and doesn’t get drowned-out by the back-up singers and instrumentals. Heidi said people are going to say about him that he has had a huge impact on the music world like they say about Michael Jackson and others. Mel B told him he could “easily win this!”. Howie agreed – “You said ‘going down.’ You are moving on up!” He encouraged America to vote. Mike delivered a prediction to Howard 24 hours before the show yesterday at Howard’s radio studio. His trick involved playing cards this week and matching up pre-selected cards with the serial number on a dollar bill in which Nick Cannon had to catch in a money wind tunnel chamber. Heidi said Mike comes up with amazing stuff and is entertaining. Mel B said she believes it’s magic what he does. Howie said making numbers appear form Howard Stern’s pants – “I don’t know how you do it. !” Howie bragged that Mike was his Snapple Save. Howard told Mike that he didn’t need Desmond and is better for getting rid of him. Howie describes Blue Journey as classic dance, acrobatics combined with shadows. “I Put A Spell On You” Mel B said she liked the unpredictability of their act but tonight was a little flat. She called it “boring and repetitive”. Howie said because of them they expect so much more. I think we need more. Maybe more dancers or more angles” and said he’s not sure it they “hit it tonight.” Howard disagreed and said they were great. “you guys have presented a body of work that is phenomenal. Heidi said she loves that they always come up with something new and different and loved that the Snapple Saved kept them in the game last week. “I feel like my heart got a makeover when I entered the competition” said Emily and that she began to believe in herself again. Emily West sang “Nights In White Satin” by The Moody Blues. She received a standing ovation from the audience and judges. Heidi said she’s in awe of Emily and she’s “fantastic and perfect.” Heidi also complimented Emily that she forgets that she’s watching a competition show when watching Emily. Mel B said Emily is “dream-like in a haunting and sophisticated way.” Howie called her iconic and a star. “This is crazy! There’s never been more talent on the show,” he said in the nine seasons. Howard said The Moody Blues deserve to be in the Hall of Rock and Roll Fame and called her the most original singer that’s ever performed on AGT he said because she’s “unforgettable and amazing!” She said she chose the song because it was her parents’ wedding song. He took Mel B’s phone again as part of his trick and used playing cards. Mel B told him, “you are always doing the impossible. That act was genius!” She called him “hot!”. Heidi said out of the magicians, he’s her favorite. Howard said AGT is the number one show because of people like Mat Franco. Howie said “you’re incredible” and told him to work his magic to make votes appear! Fate Rests Upon Little Girls! Howard advised Miguel to play a lot of bars to learn how to be a great front-man like Mick Jagger and others. Tonight, Miguel sang “Gimme Shelter” by The Rolling Stones. Heidi said his voice got lost tonight and she could hear the back-up singers more. She couldn’t feel or hear his emotions. Mel B said he’s “hands-down” a rock star, Pop star, diva…everything! Howard said it’s a big, iconic song and he missed Mick Jagger, and doesn’t think there’s an emotional connection. Howie said he’s the biggest of star that they’ve had. He said he could win this thing on the votes of little girls. “America’s Got Talent” opened the Results Show with a performance by The Muppet’s after Miss Piggy had to tie-up host Nick Cannon in order to bring AGT their act. Kermit joined Nick on stage to introduce the judges. Howard was compared to the two balcony Muppet critics. Later in the show, Howard said he enjoys talking to them over his real-life judges. Jackie Evancho joined Nick Cannon in the green room with contestants to give them advice on controlling their nerves before their performances. 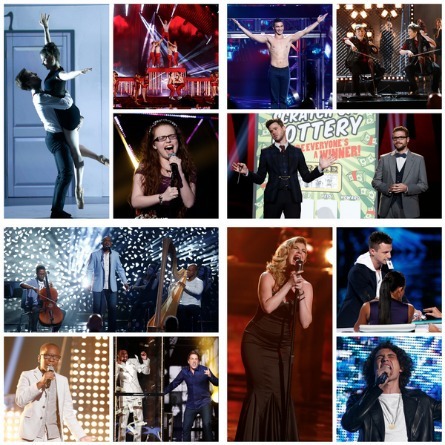 Nick then announced the first act going into next week’s finals as – Emily West. Her competitor, Mara Justine is leaving the competition. Howard reacted – “There are not words to describe how wonderful you are. For you to have stepped into the finals was not an easy task,” he then told her he wouldn’t be surprised if she won the whole thing. The next two acts called onto he stage to hear their fate was AcroArmy and Blue Journey. AcroArmy is the act that is moving-on! Howie welcomed them to the finals and said they are “unbelievable”. Going into the final results, The Muppets said good-bye. Next, Jackie Evancho performed onstage. 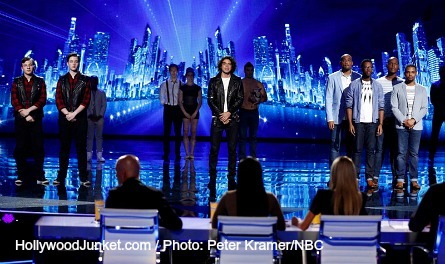 Before her performance, Jackie said being on the AGT stage in season 5 was awesome. Since then, she’s recorded five albums and has traveled across the world. After her perfect performance, Nick asked her about coming back to AGT. Jackie said she was overcome with a tidal waves of nerves and misses being on AGT. Quintavious Johnson and Christian Stoinev were up against each other to see who would make it to the next round – The Finals. The most votes were for Quintavious Johnson! Heidi said “America got it right” and she loves his grace on stage. The three magic acts were brought to the stage to find out which one of them would move on. They were Mat Franco, Mike Super, David & Leeman. The one magician to out-shine them all was revealed as Mat Franco! Mat reacted that he had no words and said it was “just unbelievable”. Howard told Mat that he thinks he has a perceiveably good shot at winning. The acts in the bottom three were brought back out on onto the stage – Emil and Dariel, Sons of Serendip, and Miguel Dakota. The Snapple Vote went to Sons of Serendip! Howie said they are musically the most talented act and he told them to keep doing what they are doing and hopefully they’ll win. The last two acts left were Miguel Dakota and Emil & Dariel where only one would get pushed through based on the judges popular vote. The Judges Vote – Heidi was the first to vote. She picked Miguel. Mel B said Miguel is already a super-star, and Emil & Dariel have stepped-up to the plate. She went with Miguel. Howie’s vote really counted. He said Emil & Dariel are an “amazing talent” and Miguel has the biggest star appeal. But he based his vote on talent and selected Emil & Dariel. Howard had the possibility of the deciding vote if he voted for Miguel. But his vote was for Emil & Dariel which made it a tie. So, the deciding vote was up to America. The act that got the most votes was Miguel Dakota.